Cheap digital storage space has revolutionized the way we DXers can save, organize and access our recordings and QSL collection. Creating a digital DXing archive however requires many decisions concerning formats and file names, with long lasting consequences. This article explains the many mistakes I have made, and how I have tried to resolve practical problems related to going digital. Most DXers record their best catches, send reception reports and collect verifications received from radio stations. All of these stages can be done in various ways, with the digital revolution making matters both more efficient and user-friendly. The transition to a fully digital DX collection is however not an easy one - and the longer you have been DXing, the more complicated digitizing your collection is. I started recording station identifications, sending reception reports and collecting QSLs in 1980. In the 80's I unfortunately saved only very few recordings, which in hindsight was a major mistake. Another mistake was to focus only on the rare catches. Many of the common shortwave broadcasting stations of those days don't even exist today, and I don't have any recordings of these historical stations. You can never record too much - can you? Lesson number one: you can never record and save too much. However, this was only true until the advent of software defined receivers (SDRs) - now you can indeed record and save way too much, but more about that later. Until the late 1990's I saved my recordings on cassettes. Then came Minidiscs, which I used to archive station identifications until 2003. In 2003 digital storage space in the form of hard drives started to become cheap enough so that I began to digitize my vast collection of radio recordings. Delving into my cassettes, I thought this would probably take a couple of weeks of fulltime work. How wrong can you go. That was four years ago, and I've completed maybe two thirds of the job. To be honest, the process is complicated by the fact that I want my digital sound files to include information not readily available: I need to consult my old logbooks to find out the exact dates and times of my recordings. In any case, I'm glad I started digitizing sound files early - the digital files are so easy to access now. I don't bother to browse my cassettes any more, not even to send follow-up reports, because it seems to take ages to find what I'm looking for. The first issue to consider was format. Real media format was already on the decline, while MP3 was rising in popularity. From the start I decided that the format must be a market leader (so that I can hopefully find software to play my recordings 20 years from now, or at least to convert them to another format) and light (so that recordings can be emailed to stations and fellow hobbyists). After mistakenly betting on Real Media, I eventually decided to use both MP3 (.mp3) and Windows Media (.wav) - I would immediately record each clip in both formats. I would use the MP3 files for emailing clips and Windows Media to have a higher quality master file. Even though file size is no longer an issue, there's no need to make clips any larger than necessary. 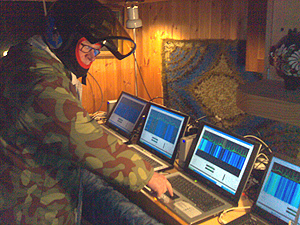 The sampling rate is not so crucial as DX recordings are already noisy. And since the original is mono, there's no sense to record in stereo. There are countless recording software on the market. My choice was Polderbits Sound Recorder and Editor, which is very easy and fast to use. It has an equalizer, and a couple of filters, and also works as a converter between formats. After a trial period the software costs 30€/$40. I am already so used to Polderbits that I wouldn't be able to objectively compare it to competing software, so you better do your own research on the Internet before deciding what's best for you. I normally record the station ID, sometimes including other announcements and some music, with a short fade-in and fade-out. Here are two MP3 samples, an Alaskan station KASH Anchorage on 1080 kHz, when I first heard it in Finland back in 1987, and again in 2005, with new call letters KUDO. A crucial issue to consider is how to name the sound files. My idea was to name files so that exactly the same file names could be used on the Internet, because that would be the channel to share them - so no spaces between words but underscore instead. Looks ancient, but works universally. The number of files is bound to explode, so you better come up with a logical folder and naming system from the start. I have chosen a folder structure based on continents at the first level, then divided into countries and further in some cases into states. In each country/state folder, the station sound files are automatically listed in order by frequency, station name/call letters, date (year_month_day) and time (UTC). In many cases I have a number of recordings from the same station, and this helps to keep everything in neat order. I have separate folders for unidentified stations. Any clip is just a few clicks away, as long as I remember the frequency of the station - and since I focus on mediumwave (AM) DXing, it is relatively easy. I'm not claiming that this would be the best way to organize files, it is just the one I came up with. Considering the amount of files already in my folders, I probably wouldn't change anything even if I learned of a better system. Something to consider before you spend hundreds of hours organizing your digital DX - the last thing you want to do after organizing your collection is to start reorganizing it. You can get away with a messy collection by using an efficient search such as Google Desktop Search, as long as you have at least something unique and easy to remember in the file name, but - with my poor memory - I have found the above structure to be very useful. My first media files in the late 90's were only named after the station name. Getting organized didn't matter as long as I was dealing with only dozens or hundreds of recordings. However, I currently have about 9000 clips of station identifications from over 3000 different stations, so it was important to come up with a scalable solution. Software-defined receivers (SDR) have brought a whole new dimension into recording. For instance, the SDR-14/SDR-IQ receiver equipped with Spectravue software can record a 196-kiloherz wide section of the band. A recording of just under 46 minutes produces a 2 GB sound file. I have preserved some of these files even after extracting the interesting station identifications, because they allow you to relive some memorable DXpedition conditions, and also make it possible to toy with notch, AGC and filter bandwidth later on. As storage space is really no longer a cost issue, it could be tempting to save everything you ever heard or recorded. However, I doubt I would ever want to go that far, because no one, not even me, would ever want to listen to all of those recordings. An internet connection gives more opportunities. If you have enough storage space online, you - or anyone you want to allow - can now access, print and play your files from anywhere in the world. Occasionally when I have visited radio stations it has been nice to be able to play their ID straight from my online ID collection. So now you've got the recording of that rare catch, neatly named and organized. Sending a reception report just became easier. I admit that I have been slow to adopt sending reception reports by email, and only for the past year have I sent the majority of my reception reports by email. I have however included my email address in my reception reports as long as I've had one, so I received my first email QSLs (eQSLs) already in 1995. Until now I have basically used the same template and text in email reports as in letters, but I have a hunch that shorter emails would work better, and so now I'm trying to be more concise. I would always attach a family photo and an MP3 sound file along with the email. I would still like to think that reception reports are not spam, and because of spam filters, it makes sense to edit them so they don't appear to be spam. My over-sensitive spam filters have swallowed even eQSLs, so the same is probably happening occasionally at the other end to my email reports. Based on the criteria spelled out by my spam filter, trivial issues like addressing the recipient as "Dear", and including internet links, can increase the probability that the email is regarded as spam, so it pays to tailor your message. This is a folder excerpt from Colombia. My eQSL archive consists of various file types, with stations listed in frequency order. Initially I used to just file all eQSLs to one of my email folders. Soon I however started to save them in two different formats, because the email as such looks lousy in a collection. The first would be in .eml file format, making sure all the header details were included - an original, sort of. Attached sound files, pictures etc I would save as separate files. I would then open the email file in a text editor, and edit further in MS Word, attaching whatever visual material was at hand to make it look better. If the eQSL included a logo or a picture, I would copy and paste it to this fancier version of the eQSL. If not, I would check if the station has a website and copy a logo, a photo or a coverage map from there. Finally, I add a headline with the station name, location and frequency. 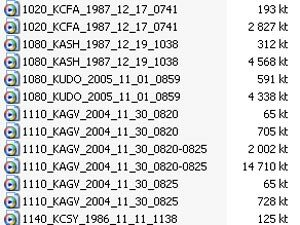 For an example of what it looks like, check out the original text file of my eQSL from KAGV on 1110 kHz from Alaska, and the enhanced MS Word version, which is the one I have printed out for my QSL collection. (Note: the original text file will show the headers only if you load it with your email software, otherwise you'll only see the message.) The MS Word version comes with reduced header details, although personally I like to include the message ID number for the sake of proving authenticity. The eQSLs are arranged in a folder and file structure similar to the sound bites described earlier. As over 90% of my QSLs nowadays arrive by email, I need to keep them in some kind of order. 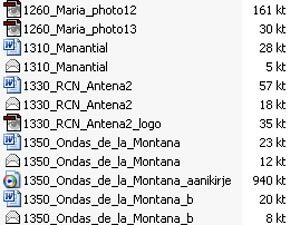 The total number of files in my eQSL collection is now around 2900, probably from around 1000 different stations. Archiving the vast collection of traditional printed QSL letters and cards as digital image files is something that I plan to do eventually, but not in the near future. Scanning everything would take so much time that it sounds like a project I will have to put off until retirement, although I would really like the idea of having an electronic copy of the original QSLs, because of both sharing and security. One of the major benefits of digital material is of course that it is easy to duplicate. Since all it takes is to copy the files, it makes sense to have a backup copy of your entire hard drive, preferably in another location, away from home. This would protect your valuable collection even in case of a fire, flood, theft, or whatever your potential calamities might include. Also, digital would be the way to go if we DXers plan to save something for future generations. Storing a few hundred gigabytes is easier than an office room loaded with the original treasures. There are at least a couple of QSL Museum initiatives around the world, but for the majority of QSLs out there, their fate depends on our offspring, and our grandchildren may not appreciate having to store endless piles of more or less historical postcards. Sadly. Not that the digital storage options available today would necessarily be any more permanent. In any case, I expect that it won't be long before we see the first digital DX legacy on the Internet. What I mean is that someone will post his QSL and audio collection highlights not just for fellow hobbyists to enjoy right now, but specifically aimed at future generations, when shortwave broadcasting is already history. Unfortunately my eDX collection is not as well organized as it may sound. Aside from recordings, reception reports and eQSLs it would be helpful to have a database of the entire QSL collection. 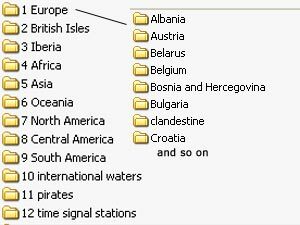 I only have Microsoft Word files listing my verified stations by continent and country, including details such as frequency, calls and date of reception. I can easily find out what and how many verified stations I have from each country and state, but that's pretty much it. Another big mistake. I should have started using Excel, at least, or preferably a database software, right from the start. It would be interesting to be able to compile statistics and graphs of the collection, document and demonstrate trends, and get a grip of the essential characteristics, but documenting the QSL collection all over again is a task that feels a bit too overwhelming at the moment. One more chore to do when I retire.